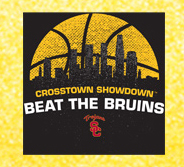 Glow-in-the-dark shirts for the first 1000 students at Saturday’s game vs. UCLA. The student entrance opens at 6 PM for students in Trojan Fever shirts, and at 6:30 PM for everyone else. Admission is free for students with their student IDs. Fans are encouraged to watch the Women of Troy go for the season sweep against UCLA at 3 PM before the men’s game at 7:30 PM. Fans can also check out the newly renovated Heritage Hall from 10 AM to 6:30 PM. CLICK HERE for tickets to Saturday’s game, and HERE to read about the first meeting between the crosstown rivals.